Can new company MWg’s prestige handset stand out from the smart phone crowd? MWg is the organisation that evolved from the demise of O2 Asia and unsurprisingly has been building on that company’s products, so the launch phones already look a little familiar, with the Atom V being the follow-up to the O2 xda Atom Life and the O2 xda Zinc has become the MWg Zinc II. It’s a touchscreen smart phone with a slide-out keyboard, similar to the HTC TyTN II in concept, though it’s ever so slightly slimmer at a (still fairly bulky) 18mm, and the screen doesn’t flip up. The large 44x58mm 65,000-colour TFT touch screen has just a call start and stop buttons and a circular D-pad beneath it, which helps to give it a slick, uncluttered look. On the sides are the on-/off button, camera shutter and reboot on the right, with volume buttons, a quick-launch button for popular apps like the media player and games, and microSD memory card slot on the left. The telescopic stylus, slightly confusingly, clicks into the bottom. It looks better than its Atom V cousin, with cleaner lines, less fussy buttons and the rubberised black plastic and chrome casing give it a classy look and feel. Travelling with it shouldn’t be a problem either, since it’s packing quad-band GSM and tri-band UMTS 3G capabilities. The slide-out is nice and clunky – it feels solid and built to last. The same could be said of the device in general, in both a good and a bad way, since it’s heavy and bricklike in the hand. Dainty it ain’t, but it does feel as though it should be reliable. A pity though, that it doesn’t come with a protective case – that large screen is just begging for scratches. The keyboard is small, as you’d expect, but the keys are perhaps just a wee bit too flush to make using them a joy – you do need to be careful when using it, though this might get easier with a bit of practise. Dedicated buttons for full stop and @ would have been useful too – as it is you have to do thumb contortions with the shift button. You can always use the touch screen of course, though you’ll need the stylus for anything more complicated than dialling phone numbers. Big-boned it may be, but it’s not short on features. There’s fast HSDPA 3G internet access (3.6Mbps, an improvement on the original Zinc’s standard 3G) and built-in GPS (SirF Star III), which works in a pinch, though you’ll prefer the flexibility of a dedicated sat-nav device if it’s something you plan to use a lot. If you need faster internet access, it’s also got Wi-Fi (WLAN 802.11 b/g and BT v2.0). It runs on the latest Windows Mobile 6.1 Professional OS, which offers a different home page and full-page zooming when browsing using Internet Explorer but more importantly seems to work faster and more efficiently than previous incarnations of Windows Mobile, even with several apps running at once. The Samsung 500MHz processor has some part to play in this, with 64MB of SDRAM. You might say that a smartphone aimed at business users doesn’t require a top-notch camera. But of course it does. If you’re going to pay £450 for a premium phone, you don’t want to feel short-changed in any department. Two megapixels feels a bit low-end on a phone like this, and without a flash, its usefulness is distinctly limited. That said, it’s pretty nippy when it comes to taking snaps and takes them almost instantly with virtually no delay, unlike many smartphone cameras. The Windows Media Player is a decent enough music player, though nothing’s been added to it with this version of Windows Mobile, and there’s stereo Bluetooth if you decide to swap the provided cheapie headphones for some wireless ones. Battery life wasn’t bad and gave us a good two days of standard use, though excessive use of Wi-Fi and GPS dropped this considerably. 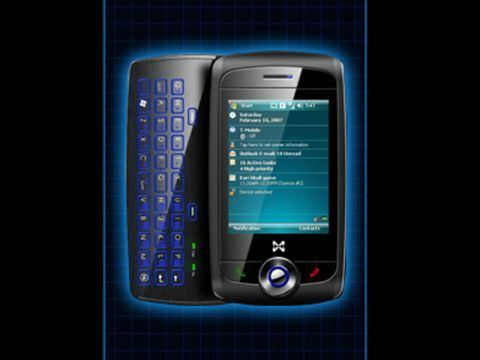 The Zinc II is a perfectly decent Windows Mobile smart phone, but unfortunately lacks anything to really distinguish it. Other phones have better cameras, faster internet access, a front-facing camera for video calling and come in more compact cases. There are some good things about it, but MWg will need to address a few issues if they’re to make a significant impression and challenge the likes of HTC. It’s a good first effort, and if you can find one cheap, it could be worth investing in one. Otherwise, wait until the next generation.